Solar Pool collectors are available on the market in many different types to accommodate the many different varieties of pools and conditions. 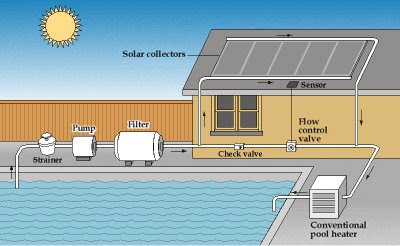 Generally, there are two main Solar Pool collector types - unglazed collectors and collectors with a glass covering (glazing). The type you need depends on the climate in your region. Unglazed solar collectors operate only when temperatures are above freezing and they are highly cost effective for outdoor pool heating. They are generally made of thermoplastic rubber (types of Solar Pool Collectors called flexible rubber mat) or polypropylene plastic treated with an ultraviolet (UV) light inhibitor to extend the life of the panels. Currently, the solar industry is widely using black polypropylene plastic collectors. These solar panels may be either rigid or have individual pipes running lengthwise. Individual collectors are normally 4'x8', 4'x10', or 4'x12'. Glazed solar collectors are similar to domestic hot water heating systems but they are not normally used to heat swimming pools. Glazed collector systems are generally made of copper tubing on an aluminum plate with a sheet of glass covering to prevent heat loss but it increases their cost. They can be two to three times more expensive per panel than unglazed solar panels. In addition to high costs, high levels of chlorine, or having a salt-water pool, can be extremely corrosive to the copper piping inside glazed panels. But if you plan to use your solar pool collectors in colder climates, or they need to operate all year-round even in sub-zero temperatures, you will probably need glazed collectors.